Welcome to Mentor for Bank Exams. IBPS SO (IT- Officer) Exam 2017 is going to be conducted, we hope you all have been preparing well for this exam. To brush up your preparation at this stage, here are some most important questions for IBPS SO (IT) exam. 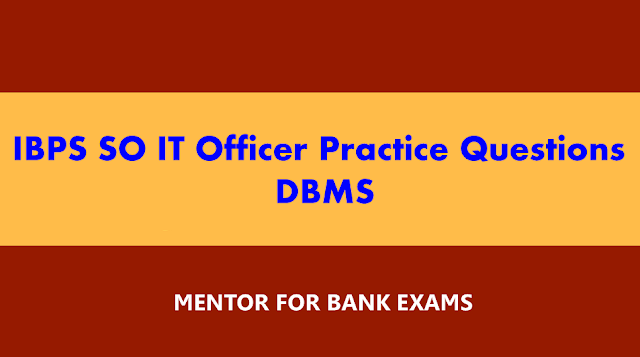 As we Know that the DBMS is an important chapter for IBPS SO (IT), so we have collected most repeatedly asked questions from previous papers. All the best!!! 1. Which of the following is a database administrator's function? 3. In SQL, which command(s) is(are) used to enable/disable a database trigger? B) identify the name, width and type of the fields of each record. 11. What is the name given to the database management system which is able to handle full text data, image data, audio and video? 13. In SQL, which command is used to make permanent changes made by statements issue since the beginning of a transaction?